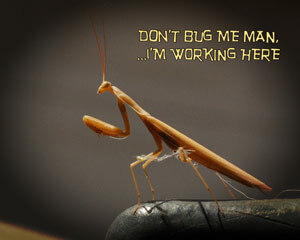 The other day I was taking some pictures of a praying mantis in our backyard. I was using a Nikon 60mm macro lens and a tripod to take the pictures. While I was able to get close enough to him without him running off, it looked like he was giving me – as I was chasing away all of the flies – a look that said something like “Don’t bug me man, I’m working here”. So I added this phase to one of the photographs, framed it and hung it outside of my cubical at work. A few days ago I was eating lunch at a Subway sandwich shop near where I work and reading Stieg Larrson’s The Girl Who Played with Fire on my Amazon Kindle. While sitting there I noticed an older woman with a walker headed for the restroom. The door of the women’s restroom was very close to my table. She was able to get into the restroom with no problem even with the walker and I resumed reading. A few minutes later, I was reading a particularly exciting portion of Mr. Larrsons’s novel and out of the corner of my eye towards the floor I noticed the woman’s two feet and her walker trying to come out thorough the door. It took me a few seconds to realize what I was seeing and looked up just as the women finally made her way out the door. It then dawned on me that the noise I was subconsciously hearing in the background was her struggling to get through the door. But, by the time I realized this, she was already past the door and slightly winded. She met up with her husband outside and by now her voice was very loud and began to tell the him the whole story about the guy to just sat there while she struggle for her life with the bathroom door. She had a point, I should have helped her, but I did not realize she needed help until it was too late to do any good. I was in another world and Lisbeth was in desperate trouble. And that my friends, is just how good of a novel Stieg Larrson’s The Girl Who Played with Fire is. Because of health and safety reasons we were not allowed to eat or drink anything in the laboratory. Of course there are very good reasons for this considering we where surrounded by blood samples. Not the kind of thing you want mixed with your food. This meant that we had to wait for our morning and afternoon breaks and lunch time to drink or eat anything. Some days it seemed like forever before lunch time came around. But now that I’m working in IT, I’m lucky enough to be able to snack and drink in my cubical. So, now it seems I have to have something next to me to drink at all times. Usually it is hot herbal tea, of which peach is my favorite. I have given up caffeine completely in my diet and only drink herbal teas. The place where I work only supplies regular and decaffeinated tea. But, the decaffeinated tea is not caffeine free. Thus, I go out of my way to make sure I have a good supply of caffeine free herbal tea at my cubical. And if I run out, it is very big deal to me. I find myself continually grabbing my empty thermos cup and sipping nothing but air. A couple of days ago I fixed myself some tea, put the lid on my thermos cup and sat down at my cubical. I’m working away and sipping my tea every now and then. After a while I could tell by the weight of the cup that I was getting to bottom and it might be time for a refill. I took off the lid and glanced inside and realized that I had forgotten to put in the tea bag. I had been sipping on slightly sweeten hot water and never noticed it .To say the least, this was a little embarrassing. Apparently, all I need is just some kind of liquid, any kind of liquid to sip on. This is when I realized that I could just be drinking plain old water and saving myself lots of money.